Do you have the lunchtime blues? 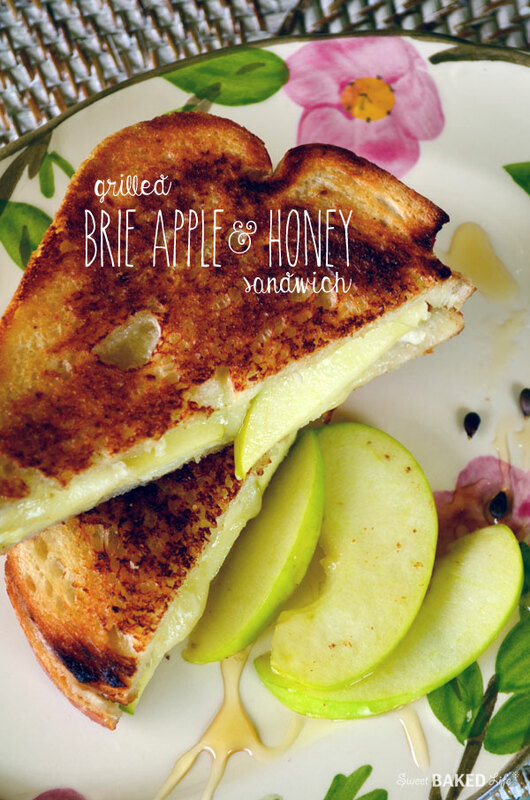 If so, make a change from your ordinary lunch with this warm and wonderful Grilled Brie, Apple and Honey Sandwich! 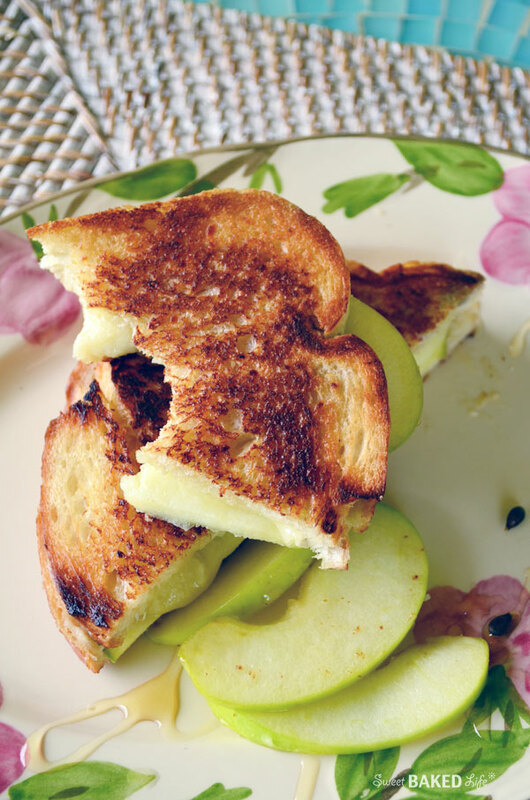 What could be better on a chilly winter day than warm toasted sourdough bread oozing with soft brie cheese, crisp Granny Smith apples and drizzled with golden honey? Nothing! Because any type of sandwich that includes melted cheese is fantastic in my book! And if you are in a sandwich rut, than this grilled gooey perfection is the way to find a new love for lunch. Or you can even add a salad and make this a delicious and easy dinner meal. You see, I am not much of a cold sandwich person. When it comes to lunch, I would rather opt for something other than chilled deli meat surrounded by two slices of lifeless bread. Ok, I know these types of sandwiches can be dressed-up with all sorts of condiments, and I have had my fair share of good ones, but really for the most part, they leave me yearning for something a bit more satisfying. So, break out of your old habits and start a new trend this year — get out your grill pan and make yourself a lunch to be remembered. You’ll be glad you did! The combination of firm buttery sourdough bread, melted cheese, tangy apples and sweet honey is amazingly good! For each sandwich, place about 3 slices of the brie on each of the two slices of bread. To one side arrange 4-5 apple slices then drizzle the top with honey. Place the other half of the sandwich on top. Spread about 1/4 of the butter on the top. Repeat steps for second sandwich. Heat a flat-iron pan, when the pan is hot add the sandwiches, butter side down. Spread the tops with the remaining butter. Grill approximately 4-6 minutes on each side, until the bread reaches a golden brown and the brie is melted. Remove from heat and slice. Serve immediately. 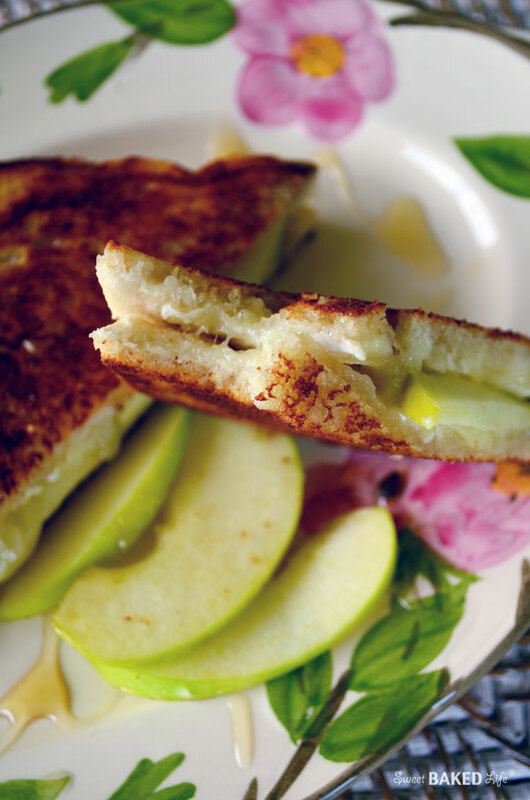 Hopefully this gooey Grilled Brie, Apple and Honey Sandwich will become one of your new favorites so you can leave those boring cold sandwiches to the birds! Hi Sarah, yes definitely YUM-O! Thanks Heidie! Have a great day! This sounds like a wonderful sandwich, and I love your photos! This really does sound amazingly good! Almost like a brie en croute, in sandwich form. Love the flavors! okay, i just got hungry. Ha, ha! Have a nice Saturday!!! !